Went to one day business trip to Surabaya yesterday, going to 2 events: Indonesia Bercerita and my Nulis Buku club Surabaya event. I wrote a story for Indonesia Bercerita’s book: 22 hari bercerita #2 called: Cerita Selma. I never write a children story before and I was confused on what to write. That’s when I attend my famous writer’s friend Raditya Dika’s writing class. He could teach really well, even to a 10 years old girl name Selma. And I was inspired to write about them. The message in my story is that you should be brave to try and make your dreams come true. About dreams, NulisBuku.com & I try to make people dreams of having their own book come true. And when you make a little action and effort to write, we will publish your dream. And the outcome of that braveness could be amazing! Just heard from Kika @theonlykika that just after 2 months self publishing Ber317an a major publisher is interested to republish the book, she just launched her book with GPU (one of the biggest major publishers in Indonesia) called Cemburu itu Peluru, she will have interview with TvOne and will soon writing a non-fiction about urban lifestyle with other major publisher. How cool is that! Nulis Buku club actually started in Jakarta. Because of our concern that there are no such thing as writers club in Jakarta. Out of 240 million people in Indonesia we could only produce around 20,000 books every year. What’s happened? To Raise awareness of writing coolness, we start to meet regularly every month. Inviting great writers like Trinity, Alberthiene Endah, Sefryana Khairil and many more. Soon, other cities are interested to make their own writing club and we encourage them to copy our model. We show them how we do it in Jakarta and they can improvised depend on their city characteristic. And I must tell you, Nulis Buku Club Surabaya rocks! A lot of great talents, initiative, and passion! It was great meeting you all at #NBCSby3 in the lovely cafe Cannoli >> @lalapurwono @WangiMS @theonlykika @ninaniena @nonInge and many more. Til we meet again! At the journey back to Jakarta, inside the plane, with the city lights, I was sobbing silently while holding these book & DVD from @netkirei & @christpramudia. 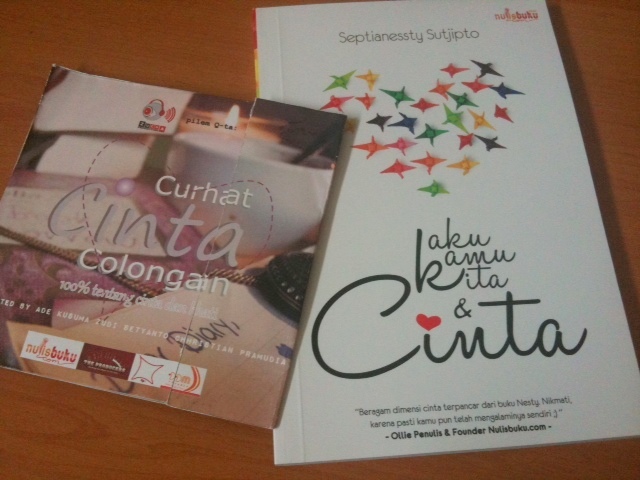 The book titled Aku Kamu Kita & Cinta. I’ve read the book. It’s professionally done from the cover, layout and editing. Love the stories so much. And I can feel her passion and dreams coming out of the book. The Curhat Cinta Colongan DVD contain a movie that Christ produce out of stories from Curhat Cinta Colongan book, a project that @nulisbuku community do together. It was very emotional book and the movie + soundtrack has been done carefully. The movie is amazing and soundtrack is beautifully touching heart. I know they both have realizing their dreams. And this… is why my partners & I created NulisBuku.com in the first place. The feeling is unexplainable and I’m overwhelmed. It is very clear that the gate to success is simply starting. Even with small simple step. So… would you start (writing) NOW? nice to meet you, mbak ollie. Sukses acaranya, semoga semakin banyak bermunculan penulis baru! Baca buku ada kenikmatan tersendiri! kapan ada di bali ya mb?? ?